(Charlestown, MA) Paul Bunyan and the Winter of the Blue Snow is about best friends and the lengths we go to love them. imaginary beasts treats us with another homegrown panto in the English tradition but with an American fringe flourish. Special effects are minimal but the appeal is high. The plot may wander but the panto’s generosity of spirit more than makes up for the meandering. 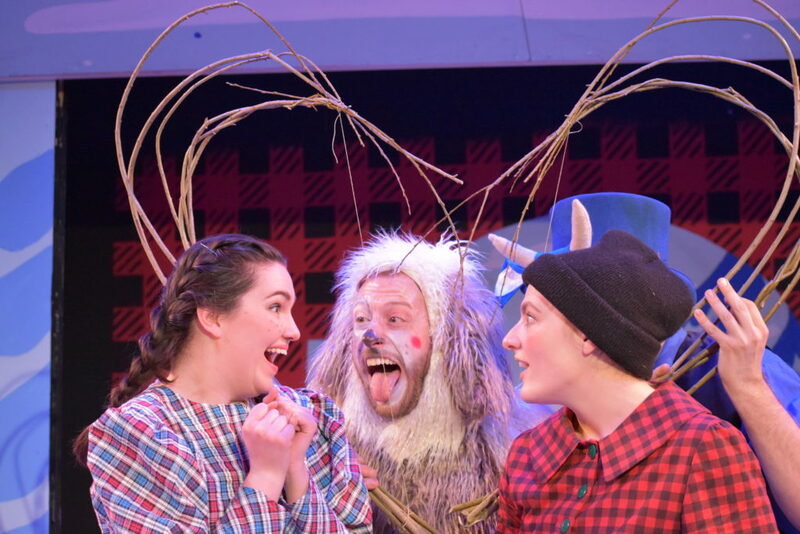 Aspiring timber-entrepreneur Paul Bunyan (Kiki Samko) and his ox friend Babe (Colin McIntire) are determined to make names for themselves in the world of the woods. They start a sustainable forestry initiative with the three Oles (Melissa Baker, Michael Obremski, Ly Meloccaro), Dame Mabel Syrup (Noah Simes), feminist role model Carrie McGinty (Laura Detwiler), and Niagara the lonesome pup (Joey C. Pelletier). Friendship is at an all-time high until King Zero (Matthew W. Woods) commandeers the plot from Oakey Dokes the narrator (Dan Prior). Unless our merry band wrestles back their happy end from King Zero, he and his minion Nip (Lauren Foster) will stretch winter into forever! Winter is coming… and is stampeded by a runaway flapjack (Amy Meyer). Libby Schap and Molly Kimmerling play precocious conifers. Jamie Semel and Jemma Tory round out the cast. Paul Bunyan has more plot twists, puppets and character arcs than a soap opera in a pretzel factory. Paul Bunyan runs a perky two hours and is chock full of unadulterated glee for all ages. The plot twists run on seemingly without end as imaginary beasts’ collaborative writing style means that every character, major and minor, is granted autonomy: loggers have ambition; pancakes crave freedom; the Moon loves blueberries. It’s important to acknowledge that everyone has a dream but it’s a bit much for a two hour show. The costuming of Paul Bunyan is top notch! Woods looks like Ru Paul’s next top Snow Miser in a suit coat by Cotton Talbot-Minkin. Talbot-Minkin’s work on Mabel’s dresses show off Simes’ figure to advantage. The flapjack costume by Sophia Nora is unwieldy like a camel turning corners but it moves likes greased lighting. Megan Kinneen’s set design is revealed to the audience like a life-size toy theatre diorama. It opens like a book and closes tidily as if to preserve the folklore within its covers. The cast prances across the stage in life-sized make believe – which is what theatre is. The set puts into stark relief what it is we actors do up there. Young and old alike will appreciate covers of “Muskrat Love,” “Big Rock Candy Mountain” and “Never Walk Alone.” The panto’s audience-participation format welcomes you to sing along if you know the words. Even if you don’t, you are still encouraged to respond to the cast when they invite you to. Responses are equal enjoyment so please share your enthusiasm with the cast. It’s a lovely panto to liven up this dreary winter. This entry was posted in Comedy and tagged 2019, Alex Sandberg, Amy Meyer, Charlestown, Charlestown Working Theater, Colin McIntire, Cotton Talbot-Minkin, Dan Prior, February, Imaginary Beasts, James K. Sims, Jamie Semel, January, Jemma Tory, Joey Pelletier, Kiki Samko, Kim Klasner, Kitty Drexel, Laura Detwiler, Lauren Foster, Libby Schap, Ly Meloccaro, MA, Matthew Woods, Matthew WoodsMelissa Barker, Michael Obremski, Molly Kimmerling, Noah Simes, Panto, Paul Bunyan and the Winter of the Blue Snow, Robin Donovan Bocchiaro by Kitty Drexel. Bookmark the permalink.